The second largest economy in Southeast Asia after Indonesia, Thailand is conveniently located to be a hub for continental ASEAN. A regional leader in tourism, automotive, electronics, Thailand has shown a resilient economy despite going through tensed political situations in recent years. 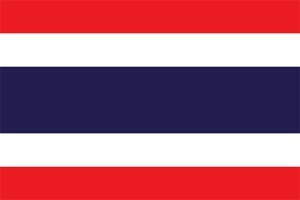 Long ranked as one of the fastest growing countries in Southeast Asia, Thailand has conquered its place as one of its top exporters. Now led by services and industry, Thailand is nonetheless also a regional hub for many industries and a leader in the production and export of several agricultural commodities and transformed products. 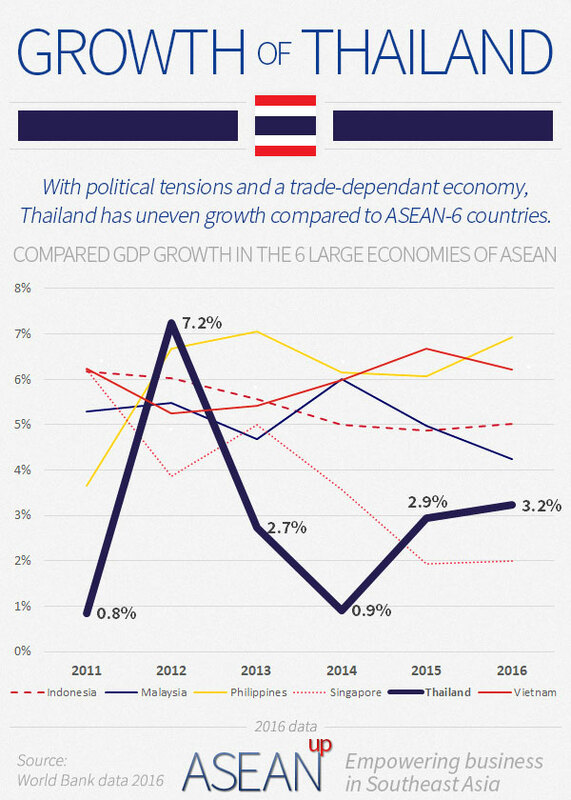 Though politics have been somewhat unstable, Thailand has recovered after a short downturn, with the resilience of the tourism industry and the countries' largest companies. New set towards modernization with "Thailand 4.0" policies, Thailand remains attractive for foreign businesses thanks to its low taxes and relatively business-friendly environment. Thanks notably to massive foreign investments, especially from Japanese companies, Thailand has become a regional hub for the automotive industry. It is also a large production center for electric and electronic applicances and components, which are exported all over the world. A leader in the production and export of several agriculture commodities, such as rice, rubber and fishery products, Thailand is primarily a service economy with a strong financial sector. Thailand is a leader for tourism in Southeast Asia in terms of numbers of foreign tourists arrivals. With Bangkok, a global capital with rich heritage, world famous islands and beaches, jungles and wild nature and famous UNESCO world heritage sites, Thailand is a world-famous destination, long promoted as "Amazing Thailand". 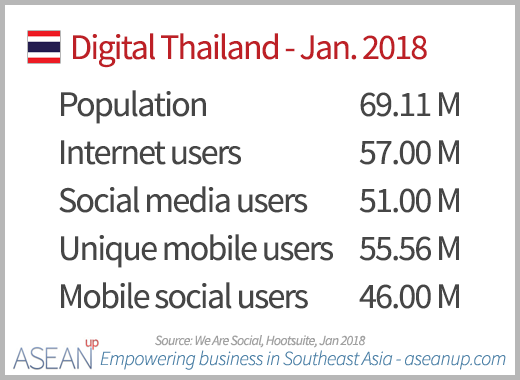 With strong enthusiasm from the Thai for digital and mobile technologies, Thailand shows some of the region's strongest engagement in social media. Taking profit from these trends, the Thai authorities are thus increasing their support to startups with the ultimate goal of modernizing the economy through their vision "Thailand 4.0". With a tropical climate, welcoming population and well-developed infrastructures, Thailand provides a very pleasant environment to foreigners willing to work in the country. 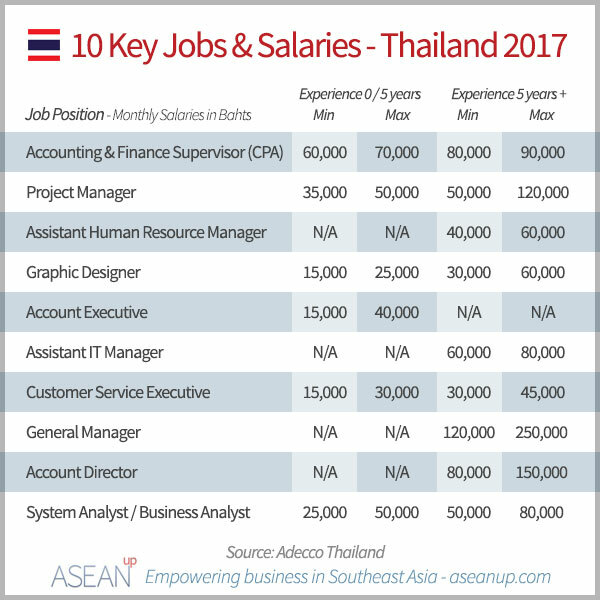 Though several industries and jobs are prohibited to foreigners, salaries for locals and expats are in the average of Southeast Asia. Thailand's economy relies a lot on export, especially for the automotive and electronics sectors as well as agricultural commodities. Though the authorities are trying to reduce this dependence, the country's economic activity is heavily impacted by its trade partners' activity. With the fast growth of air traffic, the aerospace industry of Thailand is pushed forward and anticipates good prospects for the coming years. Thailand’s airports, airlines, maintenance, repair and overhaul services and manufacturing businesses are all benefiting from this upward trend and encouraged by the authorities.